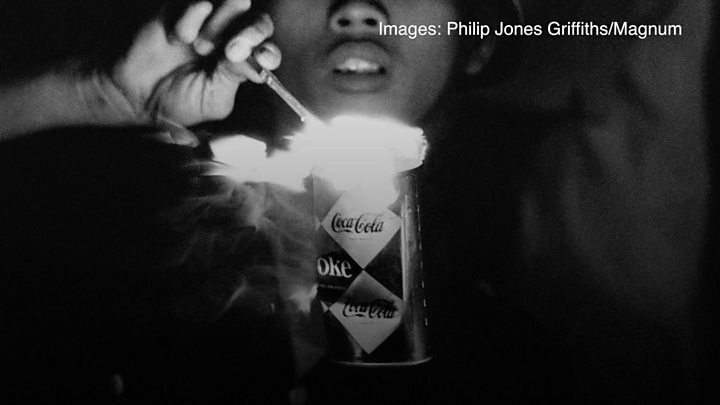 The work of freelance photographer Philip Jones Griffiths was seen as instrumental in turning the tide of American public opinion against the Vietnam War. Ten years on from his death, one of his daughters has told of what motivated him to capture such trauma. "These images burn themselves into your brain," says Katherine Holden. "There is something profoundly haunting about the images - they stay with you long after you have stopped looking at them." Image caption Philip Jones Griffiths with his two daughters, Katherine (left) and Fanny (right) in New York in 1989. Her father Philip Jones Griffiths was considered one of the great photojournalists of his era, capturing the true horror of conflict while covering the Vietnam War following the US military intervention between 1966 and 1971. His photographs and observations - published in his seminal 1971 book Vietnam Inc - gave a haunting and disturbing insight: mothers and children held at gunpoint, babies covered in blood, faces filled with terror and soldiers struggling to survive in often hostile territory. As the American author and political commentator Noam Chomsky said: "If anybody in Washington had read that book, we wouldn't have had these wars in Iraq or Afghanistan." Growing up, Griffiths' two daughters were not shielded from the reality of their father's job. "When me and my sister were growing up, he absolutely made pains to make sure we knew about the work he was doing," said Katherine. "He never tried to shelter us from it. I mean, maybe in the finer details of the grisly truth of war, but in terms of what was happening, I think he felt a responsibility to let his daughters know what was happening." Born in Rhuddlan, Denbighshire, and a first-language Welsh speaker, Griffiths started his career as a freelance photographer for the Rhyl Leader in the 1950s. "He had an affinity with the people of Vietnam and I think he saw a lot of similarities between the Welsh and Vietnamese kind of being these smaller, more village-based communities, having a kind of imperial yoke put upon them," Katherine explained. After working for his local newspaper, the Rhyl Leader in the 1950s, he began working part-time for the Manchester Guardian before joining the Observer in London as a full-time freelancer in 1961. Following a spell working in Africa he joined the prestigious Magnum Photo Agency and moved to South East Asia, where he covered the Vietnam War from 1966 -to 1971. Many of Griffiths' photographs focus on the effect the war had on the civilian population. Speaking to the BBC in 2005 he said: "I wanted to show that the Vietnamese were people the Americans should be emulating rather than destroying." As well as showing the horrors of the military invasion, his images also captures moments of compassion from the American soldiers. His colleague at Magnum, Henri Cartier-Bresson, said of his work: "Not since Goya has anyone portrayed war like Philip Jones Griffiths." Following the Vietnam War Griffiths worked in more than 120 countries including Grenada following the US invasion in 1983. She said despite his work taking him around the world, Griffiths never lost touch with his roots. "Although I grew up in London, he made sure me and my sister went to Wales every summer and hang out with our Welsh cousins," she said. "He always joked that he was a unique Welshman because he didn't drink beer, he didn't play rugby and he didn't sing." And he felt it was important that his work should stay in Wales, with his archive now in permanent residence in the National Library of Wales, Aberystwyth. William Troughton, who curated the exhibition at the National Library, said: "Philip Jones Griffiths didn't consider himself a traditional war photographer. "He was interested in showing the effects and injustices of war on ordinary people - his book 'Vietnam Inc.' had a major impact and is considered a classic." And Randy Kennedy, in his New York Times obituary, said Griffiths's "harrowing" pictures "helped turn public opinion against the war". Griffiths set up the Philip Jones Griffiths Foundation, to support young photojournalists, of which Katherine and her sister Fanny Ferrato, are trustees. "He talked of the miracle of being able travel the world and say what you wanted to say through the power of this little magical box that sits around your neck," added Katherine. "And so for us at the charity that he started, it is our aim to promote that and inspire the young people, particularly the young people of Wales, that you can actually go out and you can help stop a war. "I think that is incredibly powerful, and that is probably his enduring message in all this."